Youth Biennale of European Mediterranean Countries, Thessaloniki. Paper, dry pigment, strings, black light. An installation piece of simple means: dry pigment rubbed on paper that extends from the wall onto the floor. The spectator gets engaged spatially and is triggered perceptually through the system of the work since the piece has to be witnessed either by focusing on the wall or onto the floor. This two-faceted piece extends painterly space in the third dimension while at the same time has sculptural object hood. 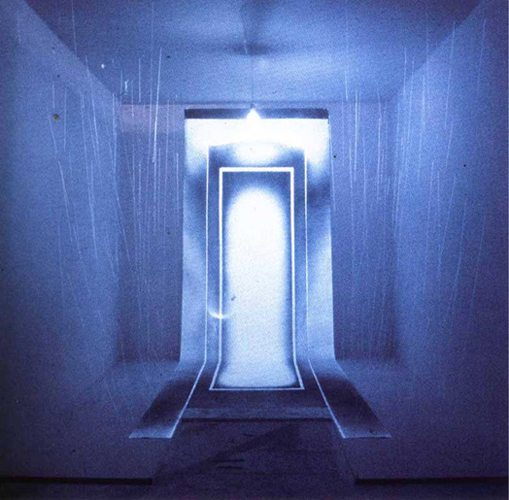 This inbuilt double nature leads the spectator, when focusing on the floor and registering the wall with peripheral vision, to see a luminous 'presence', whereas when focusing on the wall and registering the floor under perspective distortion, to see an 'absence', a 'corridor', a 'door'. The particularity of 'black light' makes paper and string glow; giving the impression of luminosity and light. Photography does not reproduce the works accurately since a corporal engagement is necessary to witness the works in space and in relation to the body.